Ken Shipley, Tom Lunt and Rob Sevier, working collectively as Numero Group, have set out to close the gap between songs seemingly gone forever and the people who have been waiting years to hear them again. Numero Group serves as an archival record label focusing on reissuing obscure soul, blues and funk recordings that hold a distinct place in the history of recorded music—or at least that’s how it started. From its inception in 2003, Numero Group has grown to include hundreds of titles touching several genres and has released these gems in a variety of mediums, both audio and visual. Their most recognized collection of releases, the Eccentric Soul series, features soul tracks on the verge of extinction from cities like Chicago, Saint Louis and Atlanta. Numero Group’s beautifully designed online record shop carries each volume of the series in LP, CD and MP3 formats to satisfy the tastes of casual listeners and the most devout audiophiles alike. Not to be confined by the conventional record label model, the proprietors of Numero Group realize that the essence of a musical moment in history can be captured by the lens as well as the microphone. 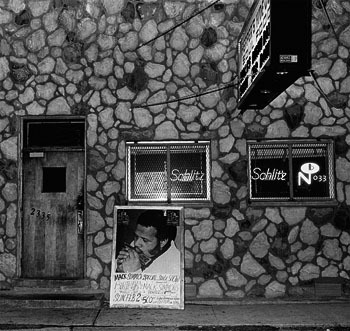 Their most recent release, a gorgeous book of rare photographs taken by Michael Abramson documenting the late 70s South Side Chicago nightclub culture, reflects this realization and bears the same painstaking craftsmanship presented in their previous endeavors. The collection of images is breathtaking and truly portrays the energy of the scene. A limited run of beautifully packaged LPs that feature songs from the era accompanies each copy of the book, and when paired with one another, the combination is one that effectively takes readers and listeners back to that specific moment in time. With each project they release, Numero Group continues to push the boundaries of what a record label can achieve and has created a comprehensive resource for those in search of preserving forgotten moments in time.